the specific details of warranties that come with solar systems. As a consumer living in Australia, you’re lucky to be protected by some of the strongest consumer laws on the planet. You have rights under Australian Consumer Law that no one can override. If I were to sum up the spirit of Australian Consumer Law it would be: if it sounds like a vendor is being unreasonable, they’re probably breaking Australian Consumer Law. Most people have no idea of their rights under Australian Consumer Law. Most people think that they’re beholden to the vendor’s or manufacturer’s written warranty. Nope. Here’s a simple example from the mobile phone industry. Imagine you pay $1,200 for a new smartphone with a one-year warranty. After 13 months, the battery dies. You are out of warranty, right? Probably not. If a typical person would consider the failure to be unreasonable based on, among other things, the price paid for the product, Australian Consumer Law says the vendor should bloody well fix it. And I would say that any reasonable person would expect a $1,200 phone to last more than 13 months. If it were a $50 Aldi special, you’d have a much tougher argument. Here’s another example. You have a solar power system and organise a five-yearly inspection by a solar electrician who is not from the original solar company. Six months later, the system fails and the solar company says the warranty is void because you used someone other than them for the inspection. That won’t hold up, because it’s unreasonable. You can use any qualified person you like to maintain or even repair a product and it cannot legally void your warranty. As I write, Apple are likely to be walloped by the Australian Competition and Consumer Commission (ACCC) for refusing to repair iPhones under warranty that had a third party replace a smashed screen. If a company like Apple can get Australian Consumer Law wrong, I’m afraid even the good installers can. Just remember: if it sounds like a vendor is being unreasonable, they’re probably breaking Australian Consumer Law. And if they refuse to comply, you can take them to your local court or tribunal where you may be pleasantly surprised at how pro-consumer our laws are. Usually, you just have to threaten to go to tribunal and they’ll capitulate if they’ve done the wrong thing. Under Australian Consumer Law, all five warranties are the absolute responsibility of the entity that you gave the money to and entered into a contract with: the solar company. If, for example, your panels fail and the solar company gives you the number of the panel manufacturer and tells you to make a claim directly, they can’t do that. They need to manage the warranty claim with the manufacturer, fix everything up for you, and then claim any money they are owed from the manufacturer. If a hardware manufacturer fails to honour their obligations, the solar company has to wear it – not you. If you ever find yourself in the unfortunate situation where you need to make a warranty claim but the solar company is no longer in business, you can make a direct claim with the company that imported or manufactured the hardware. For this reason, it is important to insist that the handover documentation contains all the hardware manufacturer’s Australian contact details. I’ll go over what should be in this documentation in the final step. Also bear in mind that if you use a solar company that imports their own hardware, there is only one company that you can go to for a warranty claim. There is no backup company if they stop trading. Kilowatts (kW) measure power. Power is how quickly you are generating or using energy. Kilowatt-hours (kWh) measure energy. Energy is how much power you have stored, used or generated over time. It is important to understand the difference between a kW and a kWh, or solar and batteries will quickly get confusing. The solar rebate is the discount on the price of a solar system at the point of sale. All prices you see advertised will already include this, and it usually reduces the cost to buy solar by a third. 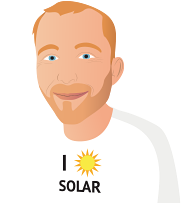 The feed-in tariff is the amount you get paid for exporting your excess solar into the grid. It is generally 6c to 16c per kWh depending on competition where you live. Solar systems can be on grid, off grid or hybrid. If you want to save money and you already have a grid connection, on-grid solar is the rational choice. Self-consumption refers to how much of the solar energy you generate gets used by your home. The more solar you self-consume, the better the economics of solar will be for you. When you get solar you need a ‘net meter’. This will measure how much solar is exported, so you can be paid for it, and how much grid electricity is imported, so you can be charged for it. The net meter does not know how much solar is generated or how much energy your home is using. To measure that you’ll need extra equipment. The best direction to place your solar panels is on a north-facing roof, if you want to get as much energy as possible over a year. It is also fine to place them on east- or west-facing roofs, where they will give you more energy in the morning and late afternoon respectively, but will produce about 15% less energy overall. The best angle to place your panels at is the angle that your roof is already built at. If you have a flat roof, angle the panels at least 10 degrees to allow them to self-clean in the rain. Don’t buy the cheapest systems on the market; they are unlikely to last long. Pay a fair price to a good installer who is likely to still be around in a few years. Your panels will come with a warranty of at least 25 years, so you need to understand your rights in case anything goes wrong. Australian Consumer Law is pro-consumer and can override written terms and conditions. If a company acts unreasonably, the chances are that they are violating Australian Consumer Law.